Choosing an elliptical trainer can be overwhelming, as the amount of features and options offered by these machines typically seems limitless. With all this information overload, you may forget the most important, but certainly not flashy, aspect — the stride length. According to several elliptical review websites, including fitness-equipment-source.com, stride length is the most important factor when choosing an elliptical trainer. The stride length on an elliptical machine is defined by allellipticals.com as the "longest total width of the elliptical motion that can be achieved." This is calculated by measuring the distance from the toe of the back pedal to the heel of the front pedal. Some elliptical trainers have adjustable stride lengths to accommodate more users. The stride length of an elliptical trainer partially determines the comfort level of the workout. This is similar to a walking stride. In general, taller people have longer strides, shorter people have shorter strides. A short stride length on an elliptical trainer may feel jerky and uncomfortable, especially for taller users. The stride length is affected by the overall design of the elliptical trainer. Elliptical machines have either a front or rear drive design. This indicates the location of the flywheel in reference to the user. The flywheel is behind the user on rear drive ellipticals and in front of the user on front drive ellipticals. According to ellipticaltrainers.com, a 20-inch stride length on a front drive elliptical is equivalent to an 18-inch stride on a rear-drive elliptical. Most elliptical review sites recommend at least an 18-inch stride length. The taller the user, the longer the stride length necessary to provide a smooth, natural motion. Elliptical trainers that feature adjustable stride lengths are beneficial if you have more than one regular user on the machine. 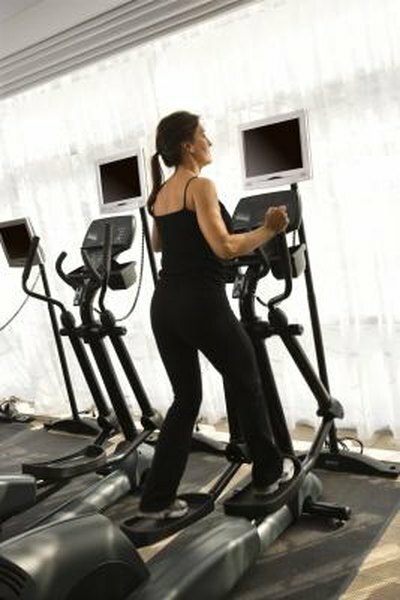 The recommendations for the stride length of an elliptical machine vary slightly between manufacturers. In general, if you are shorter than 5 feet 3 inches, you will be comfortable with a 16 to 18 inch stride length. If you are between 5 feet 4 inches and 5 feet 7 inches, you should choose an 18 to 21 inch stride length. If you are over 5 feet 7 inches, a 20 or 21 inch stride length is best.